KUALA LUMPUR, 9 April 2014 – The Prime Minister YAB Dato’ Sri Mohd Najib Tun Abdul Razak today has called on the country’s top corporate leaders to leverage on Malaysia’s diversity by ensuring better representation in terms of gender, ethnicity and age, particularly in leadership and management, to support better corporate performance and the nation’s economic transformation. “I strongly believe diversity is Malaysia’s source of strength; Malaysia’s market differentiator. Well managed, diversity drives performance and strengthens governance. Hence, like sustainability, diversity at work is good for business and good for the nation,” said YAB Prime Minister at a dialogue organised by the Economic Planning Unit (EPU) and the Securities Commission Malaysia (SC). The closed door event was attended by 50 corporate leaders representing the country’s leading Public Listed Companies (PLCs) and Government Linked Investment Companies (GLICs). Good progress in achieving overall workforce diversity and inclusion. Citing a TalentCorp - PwC Diversity in the Workplace Survey (2013) released today, YAB Prime Minister said that Malaysia has made good progress in achieving the overall diversity of the workforce, in terms of gender, ethnicity and age. However, greater efforts were needed to enhance diversity at the leadership and top management levels. YAB Prime Minister also announced that Malaysia’s female labour force participation rate (FLPR) has increased from 49.5% to 52.4%for 2013, putting Malaysia very much on track to achieve the target of 55% by 2015. This positive progress is achieved through measures undertaken by the Government to introduce incentives for family-friendly workplace and work-life integration, which have been received well by the private sector. 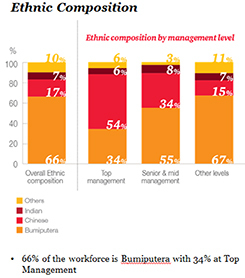 Additionally, the TalentCorp - PwC survey indicated that overall diversity is commendable on gender, age and ethnic fronts - with 38% representation of women; 67% aged 40 years old and below; and an ethnic composition mirroring national population, with 66% of the workforce being Bumiputera. 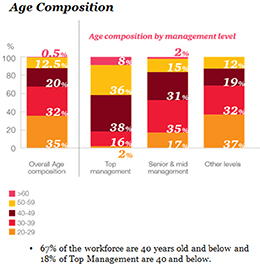 However, the same survey suggests diversity at top management could be further improved given a representation of only 24% women; 18% aged 40 years old and below; and only 34% Bumiputera. 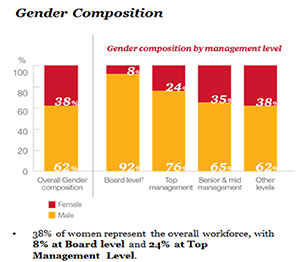 Further, corporates are making slow progress in achieving the national target of 30% women on corporate boards by 2016. PEMANDU - NIEW Women on Boards Baseline Study (2013) shows that only 8% of board members of all listed companies are women. Despite more than 700 women having been trained under the NAM Institute for the Empowerment of Women’s (NIEW) Women Directors' Programme over 2012 and 2013, to date only 115 placements have been made to listed companies. The Government remains committed towards further enhancing diversity in the public sector in leadership positions. The Government has already exceeded the target of 30% of women in top posts in the civil service. However, the agenda of inclusiveness is beyond just the Government and needs to be embraced as a national agenda championed by both public and private sectors. Going forward, all listed companies will be required to establish anddisclose in their annual reports their diversity policies, covering gender, ethnicity and age for board and management. Currently, listed companies are only required to disclose in the annual reports their gender diversity policies, particularly in the context of board selection. JPA and TalentCorp will, through the Scholarship Talent Attraction & Retention (STAR) initiative, facilitate channelling of top Government scholars to serve their bond with leading listed companies championing greater inclusiveness. Also present at the event were Ministers in the Prime Minister's Department Dato' Sri Abdul Wahid Omar and Dato' Sri Idris Jala; SC Chairman Datuk Ranjit Ajit Singh; EPU Director General Datuk Dr Rahamat Bivi Yusof; Bursa Malaysia CEO Dato' Tajuddin Atan; TalentCorp CEO Johan Mahmood Merican; GLIC CEOs and senior representatives from the Top 50 ompanies listed on Bursa Malaysia such as Tan Sri Azman Hashim of AMMB, Tan Sri Gnanalingam of Westports, Tan Sri Jeffrey Cheah of Sunway and Datuk Rohana Rozhan of Astro. In September 2013, TalentCorp commissioned PwC to conduct a Diversity in the Workplace survey to gain a better understanding of the current diversity levels in the Malaysian workforce, with the support of Bursa Malaysia. We had 122 respondents to this survey, representing 11 different industries.